We eventually got to their house, where I was introduced to a middle-aged women. They all spoke in Efik, I did not understand them. So I became more afraid, thinking that they were planning to eat me. The woman asked me to sit down and said in English “Poor girl, I learnt you were crying inside the bus thinking we would eat you in Calabar. We are not going to eat you. Now change your dress and have your bath.” I refused to take my bath. I told her I would go and do so in the camp. However, after much persuasion, I agreed. Before I could finish my bath, they had prepared food, which I ate reluctantly. The soup was quite delicious. Damilola Ajenifuja, They Will Eat Me in Calabar, p. 13. This tale of fear of cannibalism in Calabar is a scene not from a colonial travelogue, but from a memoir by Damilola Ajenifuja, describing her posting to Calabar during her year as a member of Nigeria’s National Youth Service Corps (NYSC). Ajenifuja, a graduate from Ibadan in southwestern Nigeria, plays on her own uninformed fears of non-Yoruba Nigeria, before demonstrating to the reader how her Christian faith enabled her to overcome the ‘ordeal’, tests and temptations of her NYSC year. NYSC was established in 1973, as part of attempts to rebuild the fragmented nation after Nigeria’s terrible civil war of 1967-70. The NYSC scheme compels all Nigerian university and polytechnic graduates under 30 when they graduate to serve for a year in a part of the country other than their home state. 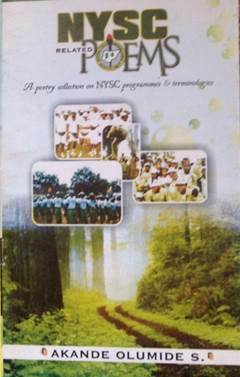 As David O. Olusola puts it in his NYSC handbook, the programme is designed to ‘bring young Nigerian graduates from different parts of the country together, irrespective of culture, belief, religion and social background’ – to build links and overcome suspicion between Nigerians from different parts of the nation, as well as to provide a workforce for development projects and essential jobs. 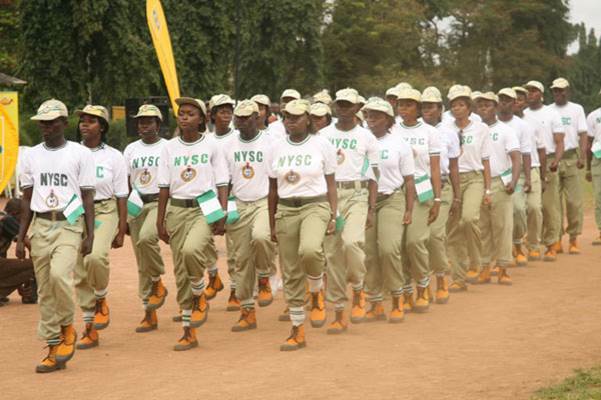 Corpers begin their service with an orientation camp (famed for its military-style training exercises), and are then posted anywhere in Nigeria for a year, where they carry out a community development project as well as a job placement, often teaching. Though NYSC is by no means ubiquitous – only a small percentage of Nigerians are graduates and therefore eligible for the scheme – nonetheless there it has a visible popular culture; Corpers have a distinctive uniform, their own slang, songs and a reservoir of shared experience. Furthermore, since Corpers are literate university graduates, it is unsurprising that a literature about NYSC has been steadily growing. This literature spans novels, poetry, self-help books, blogs, films, autobiography and manuals for new Corpers, and ranges from cynical and irreverent takes on the Corper experience to earnest handbooks urging Corpers to take on the challenge of national unity. Publications and blogs targeted at Nigerians returning from diaspora to serve are also emerging, designed to help them prepare for the challenge of culture shock as well as the rigours of the service year. I became interested in this literature about NYSC during my doctoral research on Nigerian domestic travel writing, thinking about it as an alternative form of travel writing, about an experience which is shared by at least one strand of Nigerian society. Although on the surface NYSC literature often ‘narrates the nation’ and draws on the same themes of Nigerian unity as the conventional travel writing I was researching, it is also about the relationship between youth, travel and experience, and about hope and disappointment in the state. Former Corpers are also often less reticent than conventional travel writers to write about their disappointments and prejudices about other parts of the nation. While for some Corpers the scheme broadens their horizons, results in inter-ethnic marriages, staves off the looming threat of graduate unemployment for a year and provides them with new opportunities (travel writer Pelu Awofeso, whom we interviewed previously on Africa in Words, credited his NYSC year in Jos with inspiring his love for travel writing), for others it is an ordeal to be endured for a year before they can get on with life. The scheme has faced controversy for poor living conditions and remuneration, for posting Corpers to dangerous and sometimes deadly assignments – Corpers were killed during post-election violence in 2011 – and for fraud and corruption, including allegedly reserving the most coveted postings in Abuja or close to home for Corpers with connections in high places. Many ex-Corpers will tell you of a friend who enjoyed him- or herself for a year in Lagos while they themselves endured a posting in a tiny, faraway village where they didn’t speak the local language and saw electricity only occasionally… (‘I told him that there was no infrastructure and also said since it is a village mosquitoes would bite me’ recalls Damilola Ajenifuja of her less-than-favourable reaction to her posting in Ikom.) There are also sometimes tensions between host communities and these well-educated, English-speaking, middle-class graduates who seem to parachute in, representing another world entirely. This concern about what life in an unknown place might hold out for the vulnerable Corper is one of the resonances of the trope of cannibalism in Ajenifuja’s memoir, They Will Eat Me in Calabar (2000). Cannibalism does occasionally surface in Nigerian writing about other parts of the nation; travel writers in the early Yoruba-language newspapers of the 1920s, for instance, described the supposedly cannibalistic nature of southeastern Nigerians. Cannibalism in these texts can ostensibly function, as in colonial discourse, as an emblem of the fearsome nature of the unknown, the writer’s fear of being consumed by the other, and the supposed cultural superiority of one part of the nation over another. But it is also often playful; the writer teases the reader with ambiguity as to whether he or she is just playing with stereotypes. Whenever Ajenifuja, for instance, raises the notion of cannibalism, it is also quickly dismissed by those around her as nonsense, and much of her memoir is instead concerned with friendships with locals and fellow Corpers, interesting bits of local knowledge and Efik words that she picks up. However, what I find most interesting about Ajenifuja’s memoir is how the spectre of cannibalism is replaced later by the another spectre: female sexuality. Ajenifuja describes how part way through her service year she realised that she and a male Corper were mutually attracted to one another in ‘lust’. Ajenifuja, whose Christian faith is prominent throughout the memoir, describes her horror at this ‘temptation’ to ‘backslide’ and how she ‘wept day and night, though the Lord did not leave me any time’. She quotes numerous Biblical passages as help for Corpers who might find themselves in similar situations, and the conclusion of the memoir is devoted to advising readers to submit to God and the Holy Spirit in such times of difficulty. This gendered motif is not one typically found in conventional travel writing, but it is certainly a trope familiar to readers of Nigerian popular fiction, in the (often misogynistic) figure of the ‘good-time girl’ who meets her downfall away from home in the big city. A similar gendered trope emerges in Debo Awe’s Yoruba-language novel Kọ́pà (1990), which tells the tale of a group of Corpers serving their NYSC year in Ilorin, in northern Yorubaland. Amongst the many strands of this interesting and politically-aware novel – which is both hopeful about the possibility for national unity and despairing of the political will to bring it about – one part of the novel focuses on the relationship between Corpers Bola and Maiki, with disastrous consequences for Bola as she is transformed, as Awe tells it, from well-brought up small-town girl to a woman who makes a terrible mistake away from home. While Kọ́pà focuses on Yoruba experiences of NYSC, a more typical approach is that of Remi Bamisaiye’s Service of the Fatherland (1985), which depicts the NYSC scheme as a forum for national mixing across ethnic divides. While it too ends with the trope of a calamitous sexual encounter and abortion attempt – a surprisingly frequent motif in NYSC novels – Service of the Fatherland follows the stories of Yoruba, Igbo and Hausa characters, both Muslims and Christians. Cultural differences are carefully rendered as differences of ‘language background’ rather than more divisive differences of ethnicity, and imagined as equivalents of one another; for instance, characters compare their experiences of send-off parties at home, with the Hausa character Usman describing ‘the Molo, the Gwoje and some up-turned calabashes, about the size carried by the milk-maids,’ while the Yoruba Biodun reminisces about ‘jollof rice, pounded yam, roasted meat’. In Kayode Animasaun’s A Gift for the Corper (2008), meanwhile, intra-national exchange becomes the central metaphor of the novel as a Yoruba Corper and his Igbo host exchange words, friendships and gifts. The texts I’ve discussed here are of course only a small proportion of those available, and are focused on Yoruba perspectives (whether in Yoruba or English language). Beyond sometimes facile ideas about national unity, the place where the vitality of writing about NYSC lies is, for me, in its intersection with the many trends in Nigerian publishing more broadly – popular, self-help and Christian literature, self-publishing, life writing and blogging. With the Nigerian nation under increasing strain, it remains to be seen how NYSC will evolve, but for as long as it still exists it will no doubt remain potent as a symbol of youth, nationhood and (failed) national promise. Joe Agbro Jnr’s Served is another text that I think should be discussed here. Thank you, I’ll have to get hold of a copy of it.